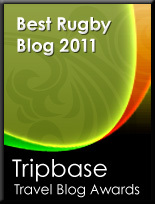 Reports from down under say that preparations for the demolition of Auckland's Eden Park's main stand as part of the redevelopment project for the 2011 Rugby World Cup have revealed the existance of trap-doors designed to give the 1981 Springboks rugby team an escape route from anti-apartheid protesters. Such was the disruption that apparently Eden Park officials called in Auckland builder Terry Henshaw before the final Test to build a series of escape hatches, including a hatch up through the roof of the changing rooms and the floor of what later became the cricket scorekeeper's box plus a series of interconnecting doors between offices and social areas. 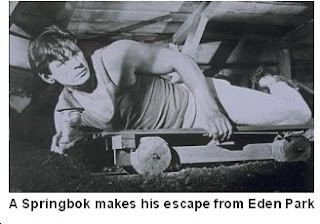 I know that, at the time, the 1981 Springbok tour and the subsequent anti-apartheid protests were incredibly serious issues and caused major ruptures in New Zealand society, but I can't help giggling at the ridiculous image of big, tough Afrikaners squeezing through trap doors and tunnels to make their escape from the stadium and the protests - like some kind of cross between the Great Escape and Escape to Victory (another role tailor made for Sly Stallone methinks). Sadly, from a purely comical point of view of course, security at the stadium was not breached and the South Africans did not have to use the escape hatches, despite the Test being noted for an aerial flour bomb attack from a low-flying plane (how times have changed).